Electric and magnetic fields are produced wherever electricity is used – they are around us all the time in modern life. Substations are a source but they are only one source. From the electricity system, high-voltage power lines produce higher fields than substations. In the population as a whole, not many people live close to (say within 100 m) a high-voltage power line. But for those who do, this will also be a significant source of exposure. More people live close to substation of one sort or another, but even if you live very close, they rarely elevate the field greatly – see more details below. Over the last 40 years there have been suggestions that magnetic fields, at the levels sometimes produced by the electricity system, may cause diseases, principally childhood leukaemia. About half of the homes in the UK with fields above 0.4 µT get that exposure from high-voltage power lines – in the rest, the field probably comes from the distribution system or house wiring, and almost never from substations. If you do live very close to a substation, that may give you a higher exposure than the average home, but probably not above the 0.4 µT level. The guidelines for public exposure are expressed in volts per metre (V/m) for electric fields and microteslas (µT) for magnetic fields. All substations comply with these limits – you can be right up against the fence or wall and still be compliant. There is no need for any extra “safe distance” between a property and a substation to achieve compliance, and there are no restriction on how close a property can be to a substation. Substations range from small substations, dotted through communities, supplying electricity at mains voltage to hmes – we call them “final distribution substations” – to much bigger “transmission” or “grid” substations, usually outside urban areas. Large National Grid substation – hundreds of metres across. 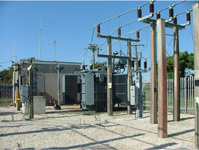 Different versions of final distribution substations – outdoors, in a building or on wood poles. All the fields comply with the exposure limits – see below. All substations comply with the exposure limits, and remember, these exposure limits are set by independent international experts, not by us in the electricity industry – we just make sure all our lines comply with them. Recognising that there is this possibility, the UK has also adopted some extra precautionary policies for particular types of equipment, on top of the exposure limits. For final distribution substations, there is a package of measures about best practice set out in an Engineering Recommendation. A surveyor may point out the presence of a substation in a survey report and may even allude to possible health effects. But they should not recommend refusing a mortgage, and whilst mortgage lenders always have the right to make individual assessments, and some mortgage lenders may choose to specialise in different bits of the market, there is no widespread general policy against mortgages on homes near substations. Sometimes, an automated online environmental search for a property may report the presence of a substation, often when it is actually far too far away to be significant – see more on these and how to interpret them. Contact the EMF Helpline – we can talk you through the specifics of the substation that affects you and answer further questions about the evidence on health or the UK policy position.